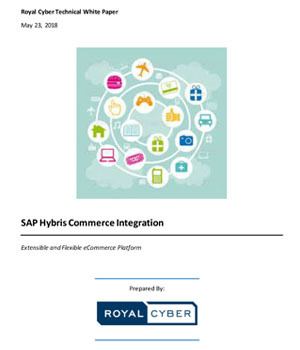 This white paper is a brief review about Royal Cyber’s expertise in SAP Hybris Platform. This paper discusses Royal Cyber’s experience in integrating SAP Hybris Commerce with various enterprise and 3rd party systems such as Sitecore, Dell Boomi, PIM, ConfigAir, BazaarVoice, Syteline, Salesforce, etc. Moreover, this paper also highlights Royal Cyber’s implemented architecture for various clients and their SAP Hybris Service offerings.